A late night quickly put together list of thankfuls. I love this linkup with Lizzi and the whole TTOT family so much that I regret when I miss out on it so here’s my week in review. I’m thankful for having a great chiropractor helping me recover from my neck injury. He’s kind, patient, and very educational. I appreciate learning more about the physiology of my body since my background is in fitness instruction. I’m thankful for being able to drive this week without any pain. My neck is slowly healing and there’s less compression on the nerve and my C-3 vertebra. I’m at 75 % and getting more mobility each day. I’m thankful that I have a hot tub I can relax in. I sit under the neck and shoulder jets and just let the soothing hydrotherapy massage my sore muscles. It’s the best part of my day and a great way to start a morning. I’m thankful for being given the clearance to do some light exercise by my chiropractor. It snowed a lot in the last while so I started shovelling. I felt so good I shovelled the whole block. I know a lot of people in my neighbourhood work in the city or are seniors. I felt good about helping and had one gentleman come out and thank me. I’m thankful for getting caught up on my laundry and only having to put it away tomorrow. Laundry is my nemesis and for four people I have no idea how much we can accumulate in one week! I change twice a day from my daily clothes to workout clothes. But my kids that’s a whole other story. My youngest likes to put on a fashion show and has some OCD tendencies so I have to limit him to one outfit a day and as many costume changes as he wants. I’m thankful for my love of books and my ability to read. My Mom taught me how to read when I was five and by grade 2 I was reading magazines and chapter books. There’s nothing better on a chilly winter day then curling up with a good book and a nice cup of tea. I’m thankful for my kids listening and being helpful when it was time to tidy up this week. They have realized they get to have more rewards when they help out so tomorrow we’ll be baking up some new Pinterest treats. I’m thankful that I was able to spend some quiet time with my love cuddling and watching movies. It’s those moments when I can feel my joy well up in my heart for how grateful I am he’s my soft place to fall. I’m thankful for healthy meals, not having to cook as my husband made us a lovely dinner. A traditional pot roast, mashed potatoes, and mixed vegetables was just what was needed on this chilly day. Its good to hear you are feeling better from the injury. This is a good list of things one might take for granted and not remember to be thankful about. I joined up just under the deadline last night too. I love this list. 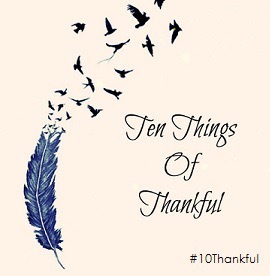 Full of so many lovely things to be thankful for. I will have to check out that site and your writing. Congratulations. I had a dinner sounding similar to yours. Delicious. I needed the reminder, thank you, to do laundry of my own. Oh wait…I didn’t really need a reminder. just keep putting it off. Glad you made it in just under the wire with this late night addition and see you next week hopefully. Onwards and Upwards indeed! I do like your lists, and I’m so happy that you got to meet your neighbours by doing something so kind and generous for them…but please make sure your neck isn’t going to get hurt again from all that shovelling! Ohhhh I’m glad he said the same thing. DO listen to him – you KNOW how bad it can be when you’re all unaligned! I don’t want you to go back to that, not even for the wonderful reason of active kindness and compassion for your neighbours! I want the warmer back! Winter has struck and it’s AWFUL! See that’s why I think if I ever make it to Canada it will need to be SUMMER when I arrive. I am trying to do the same! I’m glad you are healing and getting back to normal. I see by the comments above that others had the same concerns I did about you shoveling snow, so I’ll say no more. I do know the desire to get out and own with life following surgery. It is hard to wait. Hydrotherapy is wonderful. You’re writing for Lose the Cape? That’s awesome!!! Glad to hear you’re recovering – injury and pain are no good, but a hot tub to help sure is! I love when people have a love for reading. In my years as a teacher I would hear students say they hated to read or reading was boring and it was just so foreign to me. I guess I always assumed that everyone loved reading…sadly, not so. My daughter is a reader – started suddenly and early and hasn’t taken her nose out of a book since. I’m excited for all the things I’ll be able to pass to her as she’s ready. Right now she devours any chapter book she can get her hands on – working her way through Roald Dahl’s works right now. Hope your PJ night helped tonight! That is so cool – I’ll have to go check it out. Hardy Boys? They are awesome!